Our retreats span both coasts of the United States. From the dramatic beaches of Southern California to the cool blue waters of the Gulf of Mexico, our guests are working out on some of the highest rated beaches in America. 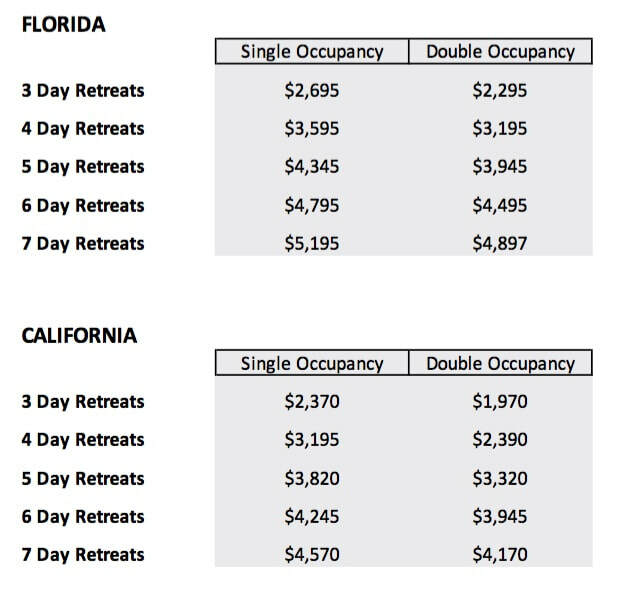 If you are looking for a private retreat with one on one training contact retreats@mensfitnessbootcampvacation.com to get private training rates. Our men's retreats run just about every week of the year. Below are some dates where we have specials taking place. Contact Us to check availability for any dates you would like to attend. If you a Florida retreat before March 25 for the week of June 9-16 or July 7-14 you will receive a 60 minute spa service on us plus $200 off the retreat price. (applies to retreats of 4 or more days). If you a California retreat before March 25 for the week of June 9-16 or July 7-14 you will receive a 60 minute spa service on us plus $200 off the retreat price. (applies to retreats of 4 or more days). All rooms are private. Double occupancy is if there are two in your party sharing a room. Arrival dates are on Sundays, Wednesdays and Thursdays. With a full array of spa services, guest can relax on the ocean front terrace in between services or once their services are complete. We recommend scheduling services as early as possible. There's nothing like a massage to unwind those aching muscles at the end of a day of workouts and to set the tone for a great night's sleep. Looking for a coed or couple retreat?